↑ "Barbara Walters". Forbes. June 14, 2007. Archived from the original on May 9, 2008. Retrieved 2008-05-08. ↑ "Miss Walters engaged". The New York Times. 1955-05-01. p. 96. 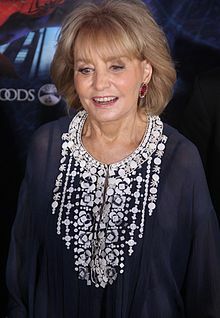 ↑ "Barbara Walters: Biography". TVGuide.com. Retrieved 2014-02-03. ↑ "Barbara Walters Announces 2014 Retirement – ABC News". Abcnews.go.com. 2013-05-12. Retrieved 2016-04-17. ↑ "Barbara Walters returns from retirement for Peter Rodger interview". LA Times. 2014-06-10. Retrieved 2016-04-17. ↑ Walters, Barbara (2008). Audition: a memoir. NY: Knopf. p. 205. ISBN 978-0-307-26646-0. ↑ Walters, Barbara (2008). Audition: a memoir. NY: Knopf. ISBN 978-0-307-26646-0. ↑ Meaney, VP-TV News Programming, Donald (April 22, 1974). "NBC-TV Press Release". ↑ "Walters to Announce 2014 Retirement on 'The View'". The New York Times. May 13, 2013. Retrieved May 13, 2013. ↑ Chris Ariens (2015-04-11). "Barbara Walters Return to 20/20 Wins the Hour for ABC | TVNewser". Adweek.com. Retrieved 2016-04-17. ↑ "Barbara Walters Interviews Presidential Candidate Donald Trump And His Family – ABC News". Abcnews.go.com. 2015-11-17. Retrieved 2016-04-17. ↑ "Barbara Walters Presents American Scandals : Programs : Investigation Discovery : Discovery Press Web". press.discovery.com. ↑ "Barbara Walters Reveals Her Annual 'Most Fascinating People' List – ABC News". Abcnews.go.com. 2015-12-02. Retrieved 2016-04-17.